Cast: Domoto Koichi, Domoto Tsuyoshi, Matsumoto Jun, Aiba Masaki, Kohara Yuki and Mukai Osamu. 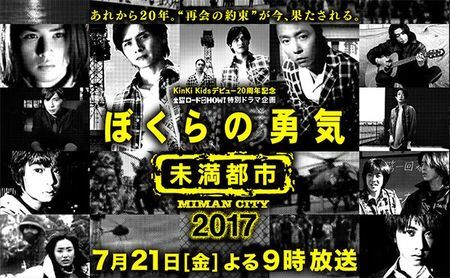 20 years ago, Shindo Yamato (Domoto Koichi), Takigawa Takeru (Domoto Tsuyoshi), Eguchi Morio (Matsumoto Jun), Inagawa Akira (Aiba Masaki) and Okamoto Kiichi (Kohara Yuki) made a promise to reunite again at Makuhara. 20 years later, they meet again, but only Yamato, Takeru and Akira arrive, and the Makuhara they know, now looks completely different than it used to. The city has been trying to get on its feet after the cover up, and a lot of money has been invested in the rebuild. If you haven't watched the 1997 drama this summary might very well confuse you. I remember the drama being one of the first dramas I had watched in my early drama watching days, and I was so hooked due to the 'dark' elements of it. This special took me right back to those days, but it also took it up a notch. I was amazed that I didn't see 20 years of difference in their acting, and the reality of 'becoming a grownup' is so clear even in this special. Of course, I noticed things (such as lacking acting and lousy cover up) that made my eyebrows wrinkle, but it doesn't ruin the overall experience. It made me very nostalgic, and happy. To sum up: a good special of the continuation story, of the 1997 drama – but I would recommend to watch the drama before the special.